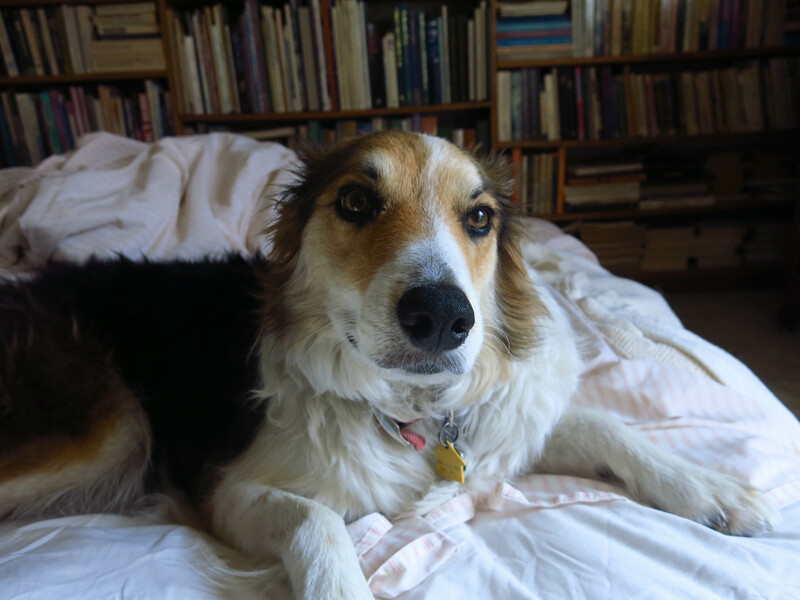 Greetings and salutations, everyone; yes, once again it is I, your popular host Mani the purebred border collie, here to bring you up to date on the news from our mostly roasted and crispy garden. You may remember me from such hot-weather posts as “Into The Garden, Endlessly Roasting”, among so many, many others. Here I am in a characteristically pensive pose. There are a couple of good places in the house to do a lot of daydreaming. The studio downstairs is the best but lying on the soft Pottery Barn sheets is pretty good too. The reason why I haven’t posted in a few days it’s because it’s been so hot that about the only thing I and the guy I live with have been able to do is take naps downstairs with the fan running. It’s been upwards of eighty degrees at eleven at night, which is very unusual for here, and I’ve really been roasting. Here I am lying in some shade on the path. It was like a zillion degrees outside that day. Almost nothing is in flower here. The guy I live with said that was perfectly okay and that it would be weird to expect flowers when it’s been so hot and dry; the humidity has been about ten percent or lower for days now. One thing that is in flower are the “Supertunias” out in front. 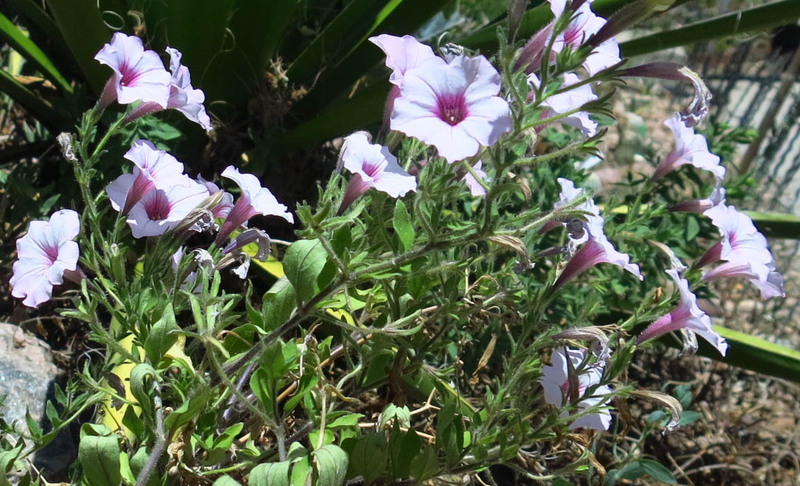 There are two plants doing just fine, in one of the hottest places in the yard. Actually on the driveway. They get watered maybe once every ten days with a gallon jug of water. The guy I live with and his friend went to the botanic gardens last week. 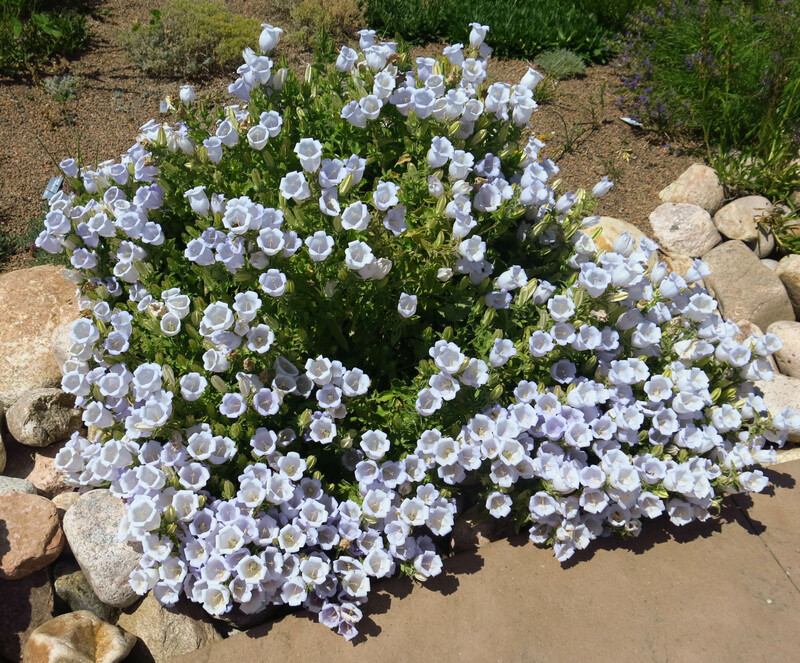 He said it was too hot to take many pictures, but he did get this picture of Campanula incurva. It’s been grown here but doesn’t do anything remotely like this. Not enough water. We got our land line fixed and now we have phones in the kitchen and upstairs bedroom. Like if I needed to make a call late at night, there would be a phone I could use. It made the guy I live with really happy, in some strange way, to have the old phone working again. He bought a couple of new phones to celebrate. He said it was nice to have the home phone working again because it was something from “the old days”, way back when things were a lot happier around here. I did find it hard to believe that “happy” could include not having me in his life, and he said he didn’t mean that, but that he could dial the phone when he was at work and she would answer. I guess I understood that. He was curious as to why the internet worked and the phone didn’t, and went online to try to find an answer. By “answer” he meant an actual explanation, not just that it works that way. He worked for the phone company for years, before they had internet of course, and always liked actual explanations instead of just “because”. I hear that “because” kind of a lot when I want to do something and he says not to, so I think there’s a double standard at work. So we have our home phone working. In fact, it even rang the day after it was fixed. It wasn’t anybody. The guy I live with said that was typical. In any case, the cord on the kitchen phone is too short for him to just stand there talking, so the whole thing is more of a gesture than anything else. The guy I live with said that gestures can sometimes be important. That was the philosophical side. The practical side had a lot more to do with accidentally washing the cell phone. I have some pictures of part of the back yard now. 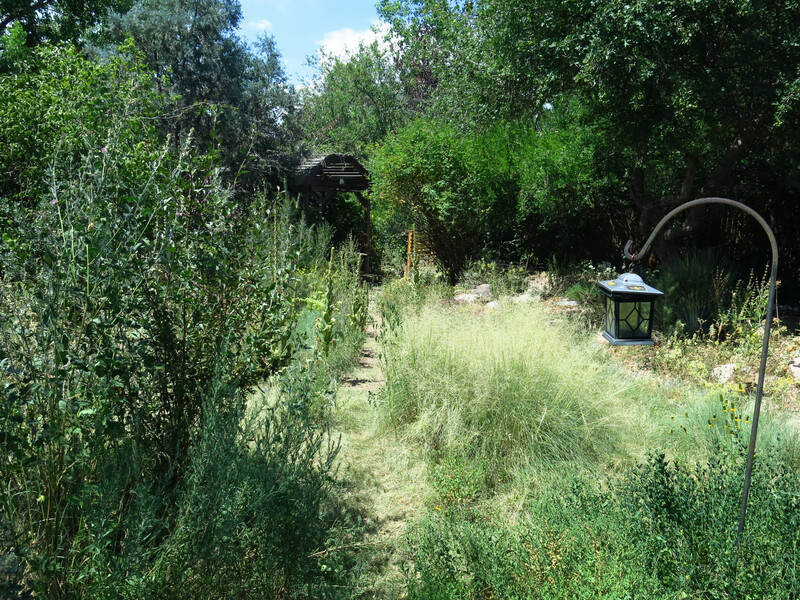 The guy I live with said he would be content growing almost nothing but grasses, because summer is so icky around here. He’s not much into watering (he says because I interfere, a statement with which I strongly disagree). That clump of grass is Sporobolus airoides. 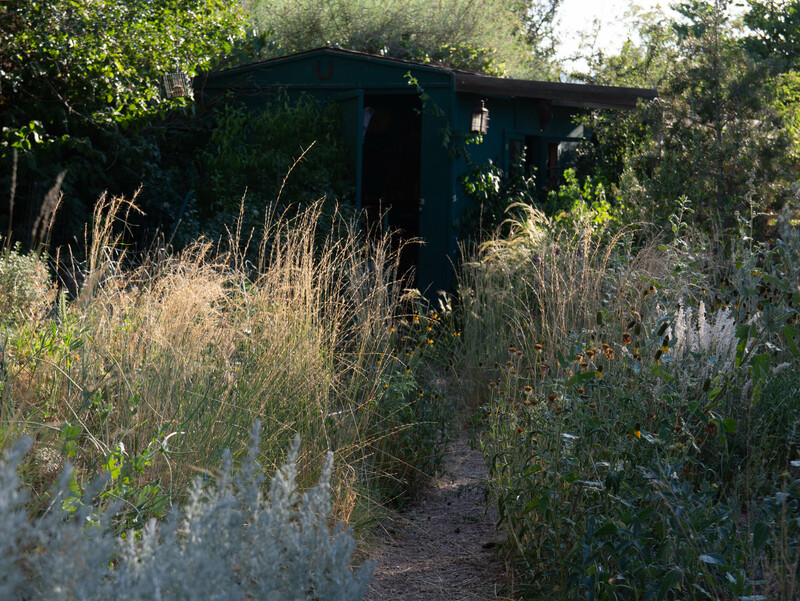 Then there are the two pictures taken with the “big camera” looking down the path to the shed. I’m not sure which one I like best. The bluebunch wheatgrass is in the background. 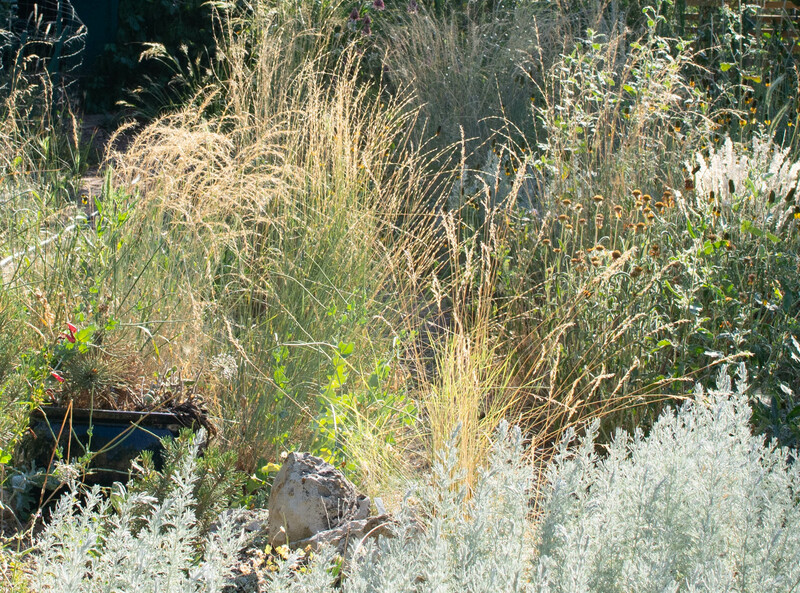 We can’t grow any of the ornamental grasses sold in the trade because they all need way too much water. Back on the tenth, it rained here for a while. Everything was all cool and damp and nice, but the next few days totally canceled out all of that. 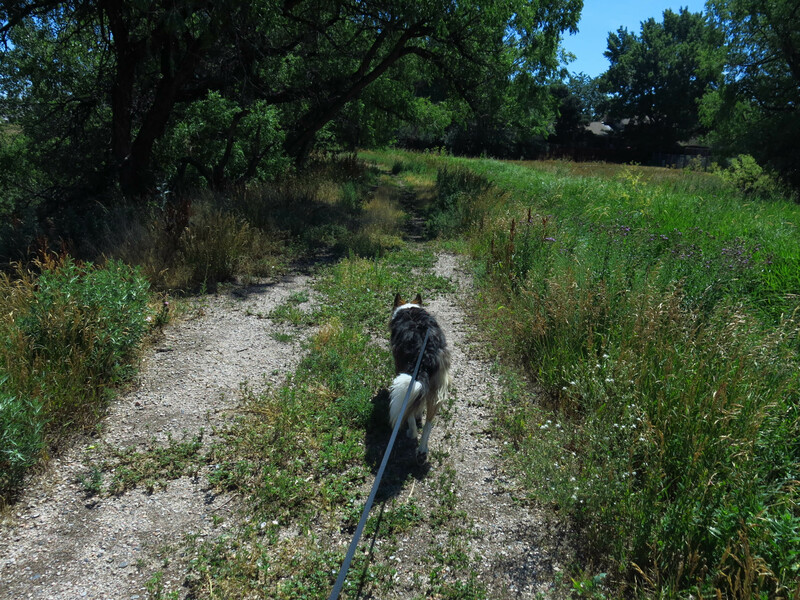 It was almost a hundred degrees last Friday, and let me tell you, that is definitely not purebred border collie weather. I had to be hosed down. The guy I live with thought I was going to bake. It certainly felt like it. As some of you may know, yesterday was the guy I live with’s birthday. He’s sixty-seven now, which I think is a lot. I’m not sure what that is in dog years. He said it was his tenth birthday without Cindy, and thinking of that made him very sad for her. It was very cool yesterday and I liked that weather a lot. The guy I live with and his friend went out to lunch. When he came back it rained a little, stopped, and the rained again. It rained so hard that the gutter above the patio overflowed, and he got out the ladder, cleaned out the gutter, and was totally and completely soaked, which is why we didn’t get a movie of this. The street started to flood, because the storm drain across the street is about a third too small for all the water it drains, so he went out and played in the gutter to see if there were branches and leaves blocking the drain. It turned out to be a very nice birthday after all. He says thanks. Being so incredibly old isn’t all that bad. Tell the guy you live with Happy Birthday! It was 111 degrees here. Its miserable to say the least. He says thanks. I would hate being that hot. He said he thought about retiring to Tucson but that his wife hated the idea of roasting, and said her “black-and-white boys” would hate it too. He said stuff about bugs crawling all over her, which almost changed her mind (she liked bugs a lot), and the birds you could see in the Huachucas, but they didn’t go anywhere when he retired. It was odd that you were not writing for a while. I know how it is though. 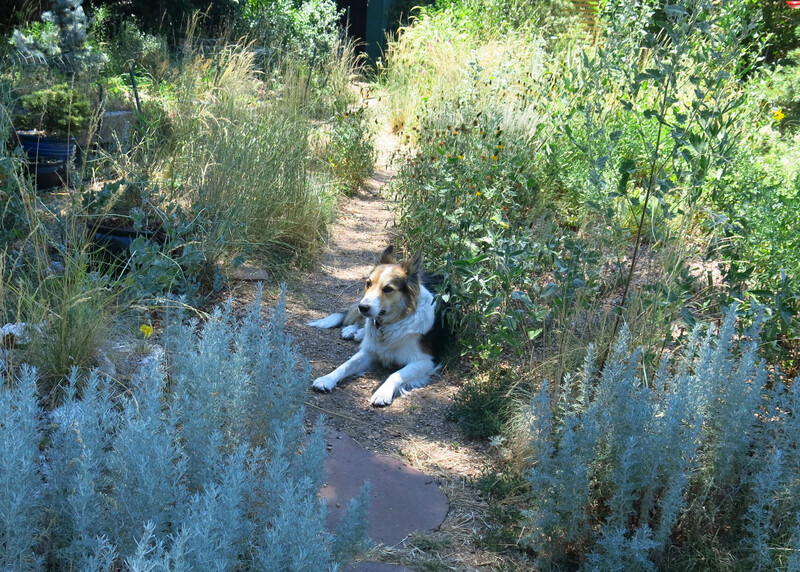 Although it had not been too terribly warm here until the past two weeks or so, and has not gotten really horribly HOT yet, Rhody has been spending quite a bit of time lounging about and relaxing. He goes down to the River during the day with friends while I am at work. I can only imagine how unpleasant warmth must be for border collies, terriers and other very hairy people. It was so hot I thought I might not make it…. I got soaked with the hose a couple of times, and also went over to the neighbor’s while he was watering his lawn and he let me play with the hose, some. The guy I live with wondered why I didn’t splash in the pool at all, but I didn’t, so it was emptied and put back in the garage. I do splash in the pool at Day Care where my friends are; it’s more fun with friends. That’s Yucca faxoniana. The guy I live with saw a lonely one at a nursery five years ago in maybe a five-gallon pot, and it was reasonably priced, so he bought it, and it’s grown huge. He said he might have to move the walk up to the front stoop. Oh my, Yucca faxoniana is a big one! I grew it only as a seedling, but lost it. That is another story. I really do like yuccas! We like yuccas here, too. Or I should say the guy I live with does. To me they are scarily pointy. You might like this post that Chess did: https://paridevita.com/2014/04/05/back-to-the-nursery/ These were bigger yuccas than the one that was planted here, and cost several hundred dollars. Each. There was one at that nursery, which the guy I live with misses hugely (but its closing saved him a lot of money) that had a trunk and was $885. Those canned small yuccas are pretty sweet. Because they are so unpopular here, I have not seen so many in one spot. The big ones do not look so great though. There is not much point in planting a big one anyway. Small ones will be big ones soon enough. They guy you live with probably told you about the giant yuccas that were so common in Los Angeles County and that region. They are cheap and common, but they are rad nonetheless. You can probably see why the guy I live with went there so often. He saw a grief counselor once a week and then went to the nursery. It got to be really expensive. One of the Black Gap yuccas is still here, too. The guy I live with said that even if he bought one of those boxed yuccas he couldn’t figure out how to plant it. Chess would not have helped. Apparently yuccas are hardier than agaves for their provenance. Like a species of yucca found in northern Mexico will be completely hardy but an agave species growing in the same location, in the wild, won’t be. It’s kind of weird. It is not all that weird. All plants have different preferences and tolerances. The Douglas fir that grows here also grows well almost as far north as the southern extremity of Alaska. However, the coastal redwood that grows with the Douglas fir here grows only as far north as the Oregon border. It does not tolerate cold weather or snow. The guy I live with said that was true, but that it was still weird. Moths can be pretty scary. One thing I noticed this year is how few white-lined sphinx moths few into the kitchen. In earlier years there were a lot, and that was pretty scary. This year has been very different in a lot of respects. If they are not in the kitchen, it sort of makes one wonder what they are up to. Or they could be plotting something unpleasant. That’s right about gestures being important. Indeed so. The guy I live with brought home some grape jelly because we were out, though there have been very few orioles here this summer, but he said it was a gesture, and besides, what if they started to show up, then there wouldn’t be any jelly for them. I infer by the yucca, Mani, the guy you live with is really serious about being left alone. Perhaps the phone laundering was some kind of *subconscious* gesture too. I myself try not to grow sharp pointy things (well, roses) because — sharp pointy things. I do think your yard looks perfectly fine the way it is right now and does not need flowers. Not a fan here of Supertunias. Your garden is much better than that. I guess the guy likes them if he hand-waters. Yuccas are the better choice. Hot weather, you are not napping, you are taking a siesta. Lead photo of you lounging in Pottery Barn sheets is wonderful. Shows you off to your best. Of course, photos of you lounging in the shade are pretty fine too. Thank you for the rain video. Probably the only way I’ll see rain for months and months, maybe ever. Thanks, and you’re welcome. 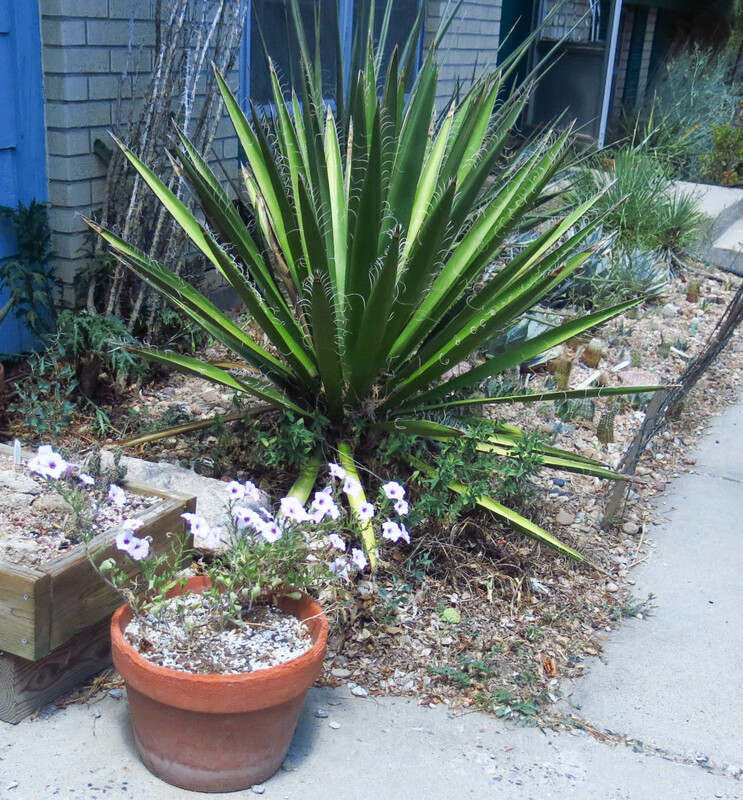 The thing about the yuccas and agaves is, the front bed was supposed to be for “marginal” plants. The guy I live with had no idea how happy the big yuccas would be, let alone that they would be big yuccas. People sometimes come by offering to replace the living room window, which as maybe you can see is the original tacky aluminum, like the screen door, but then they look at the yuccas and agaves and give up on trying to sell him new windows. The supertunias are there because he did want a hint of color…. It was 100 degrees here today. I barely made it through the day. So I guess my campanula is not going to bloom… good enough since I’d like to see it get a little bigger and rival that show! Happy late birthday, summer rain is a great gift, and it always makes me much more optimistic about the garden. We had some here as well and suddenly I was all about weeding and trimming and all the stuff I’ve been ignoring for a while now. The guy I live with says thanks; the rain was nice but today it was a hundred degrees with eleven percent humidity which may have canceled out the rain. We have almost perpetual drought here so the rain was like going around the garden and watering things just to save them, rather than sustaining a garden, if you know what I mean. Most of the sustaining-type water here comes from irrigation. Also, Mani, you are excellently laundered your own self, matching the Pottery Barn sheets for cleanliness. Impressive. Especially for a border collie, purebred or otherwise. Thanks. But if you look closely, you’ll see, maybe, why the guy I live with says I might be part stegosaurus. (He has been watching and re-watching and re-re-watching Jurassic Park movies lately.) I have a lot of mats in my coat, and they kind of stick up. The guy I live with thought at first I might be coming apart completely, then that I might really be part stegosaurus. A friend suggested that purebred border collies and stegosauruses might not be closely related creatures. So he thought about it some more. It turns out that I am shedding my “undercoat” and need to be brushed a lot. I tend to resent that.